The Joy Of Being Able To Deliver Stunning Smiles to Our Patients in Summerlin and Las Vegas is What Fuels Dr. Racanelli and The Team Each and Every Day. Stunning Smiles of Las Vegas is dedicated to supplying our patients with a lifetime of confidence. Lead fearlessly by Las Vegas cosmetic dentist Dr. Richard Racanelli DMD, the team at Stunning Smiles provides exceptional service combined with deeply rooted dental knowledge on a daily basis. Our main focus is the individual needs of every patient. At Stunning Smiles, we treat patients like family by carefully assessing all situations and providing unparalleled dental care. We are certain that you won’t find another Las Vegas cosmetic dentist that will evaluate your needs as efficiently as Dr. Racanelli, while providing a personalized plan and results in a timely manner. Same Day Dentistry: Stunning Smiles makes temporary crowns and waiting a thing of the past. Utilizing CEREC technology, we are able to create a crown in our office in under an hour. Advanced Cavity Prevention: Through the use of what just might be the handiest tool ever to exist in a dental office, the Diagnodent, we are able to use laser technology to detect tooth decay earlier than radiology. Not to mention, you won’t be exposed to radiation. Win, win! Digital Imaging and X-Rays: We don’t have enough time to list the benefits of having digital imaging and x-rays on location. Digital imaging offers patients the opportunity to see what their smile will look like after cosmetic procedures are complete. It also provides you with visual documentation of dental care. Digital x-rays are a true advancement in the medical field as a whole. With exposure to 75% less radiation and an immediate computer generated photo of your teeth, you can rest easy knowing that an x-ray with Stunning Smiles will be a breeze. That’s not all! Stunning Smiles also offers the comfort and accuracy of an Intra-Oral Camera, soft tissue lasers for gum treatment and repair, as well as examination though the use of magnification optics. We’ll know your mouth better than you do! Our number one priority at Stunning Smiles of Las Vegas is patient care and comfort. We want each patient to walk through our doors, leaving apprehension and anxiety behind. Fixing your smile is a life-changing process, and we want you to be as excited about your results as we are. Stunning Smiles offers a variety of financing options, including pre-payment, third party financing, care credit and pay-per-visit. Our Private Care Savings Plan is dedicated to providing affordable dental care to those without dental insurance. Patients can appreciate an annual membership without hidden fees, deductibles or maximums! Taking the time to answer every question, verbally walk through every procedure and addressing every concern is what makes Dr. Racanelli a leading Las Vegas cosmetic dentist. This level of practice dedication and patient care is not available everywhere. Stunning Smiles will work with you, side by side, through every step of your dental journey. 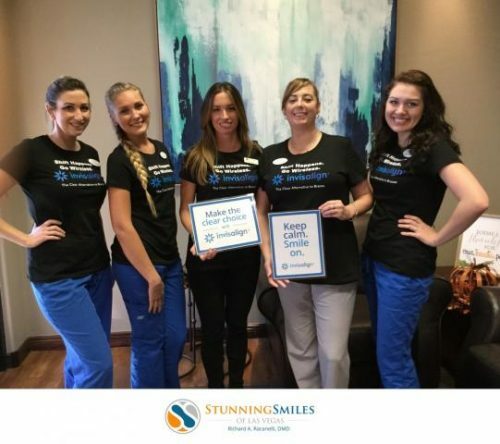 Contact Stunning Smiles of Las Vegas today to get started!